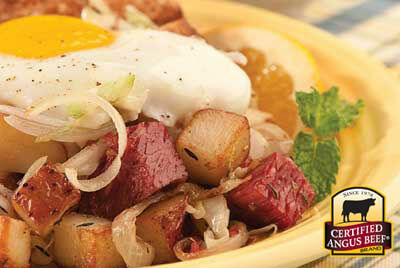 Start your day deliciously with corned beef and cabbage hash topped with eggs. This easy skillet recipe will keep you satisfied all morning long. Dice potatoes to 1/2-inch. Add to salted water and bring to a boil. Turn off heat, sit for 10 minutes, strain and set aside. Preheat oven to 375°F. Add bacon fat to skillet over medium-high heat. Sear potatoes until golden, about 5 minutes. Add onions, garlic, thyme and oregano; sear until onions are transparent. Stir in cabbage and corned beef. Season with pepper. Gently crack eggs on top of the hash and place skillet in the oven. Bake for 10-15 minutes depending on desired egg doneness.